When I committed to the Wrestlemania Menu, I knew I was going for something special for my sliders. 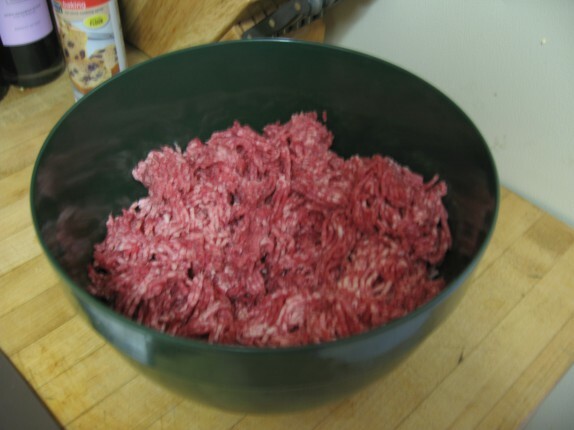 For one thing, I wasn’t going to use pre-ground beef. I wanted a special bun. So I ordered some slider rolls from All Good Bakers. 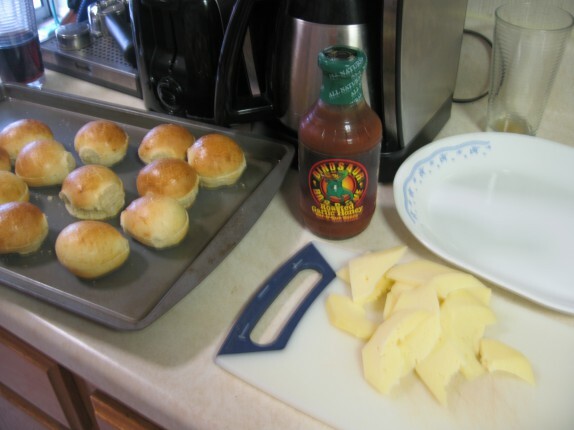 Through many communications back and forth with Britin, I finally decided that their Parker House style rolls would be simple and perfect. I ordered a piece of brisket and a piece of chuck from The Meat House; the Mahon cheese was something I also picked up there. 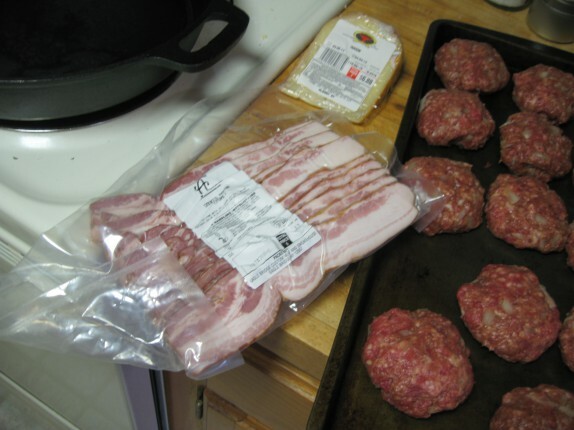 The Stillwater bacon came from Adventure in Food Trading. Dinosaur BBQ sauce is available all over the place (consider it an inside joke). So for the day of the event, I broke out the meat grinder. I got the meat ready. 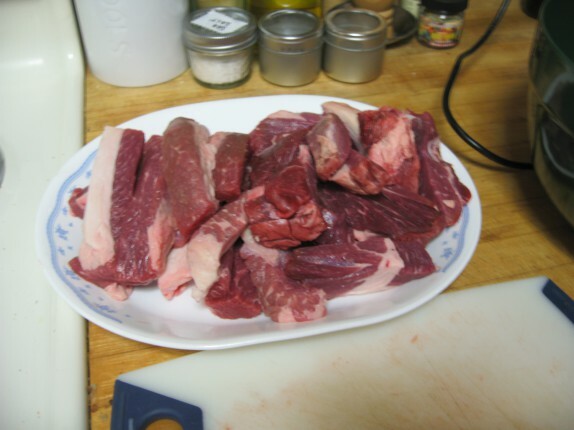 I sliced the meat into strips. And I ground away using the smallest die I have. 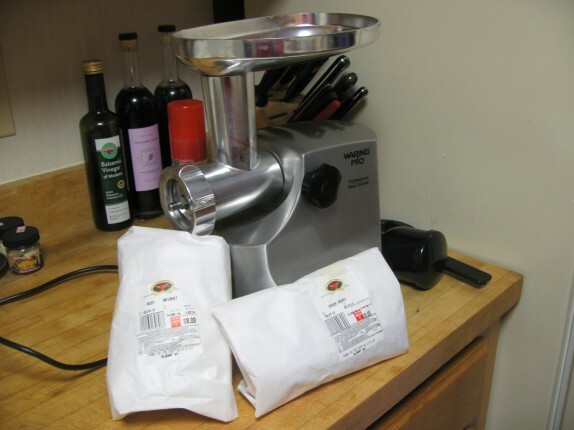 While store-bought ground beef is convenient, grinding your own will ensure much better quality, and that was the name of the game here. 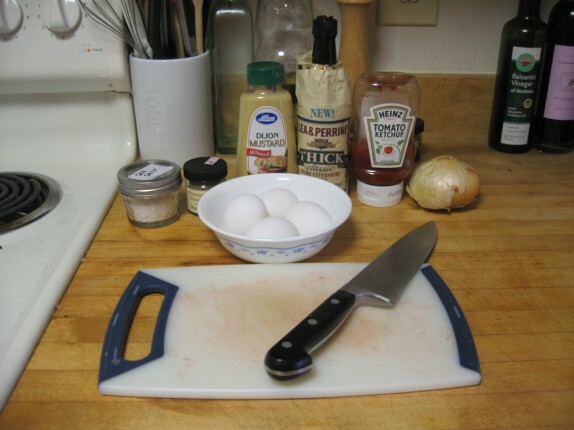 I got the rest of the ingredients ready. 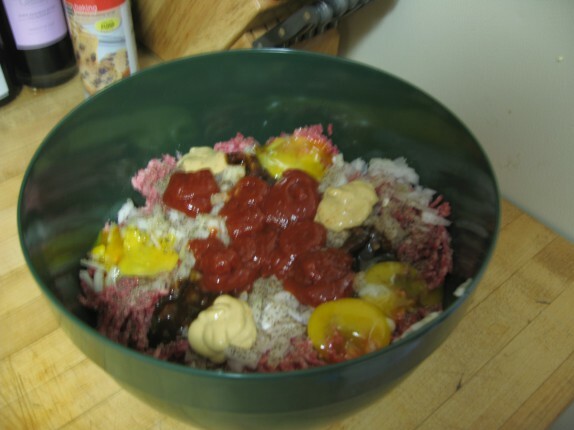 I wanted my sliders to have some flavor throughout, so I used a number of things to flavor the meat. 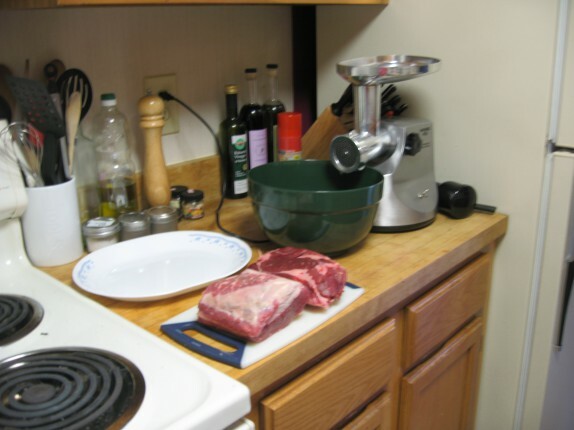 Here’s a list of how I seasoned the beef (go ahead and try to find a common denominator, I dare you). I gave this a good mix and formed them into small patties, a little bigger than the size of the bun (because they’ll shrink in cooking). 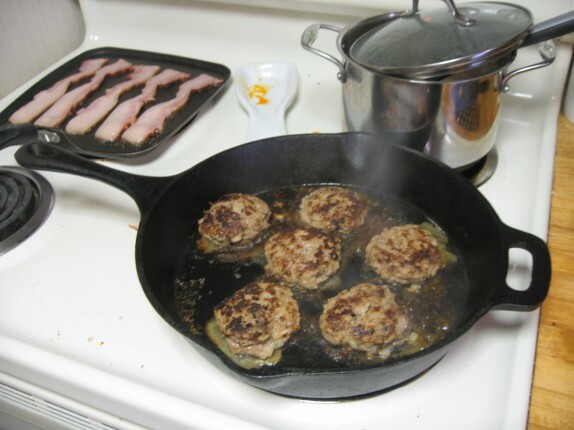 I got a skillet and a cast iron pan going on medium heat to cook up the bacon and sliders, respectively. I cooked up the patties for a few minutes on each side. And I got an assembly line going with the rest of the toppings. 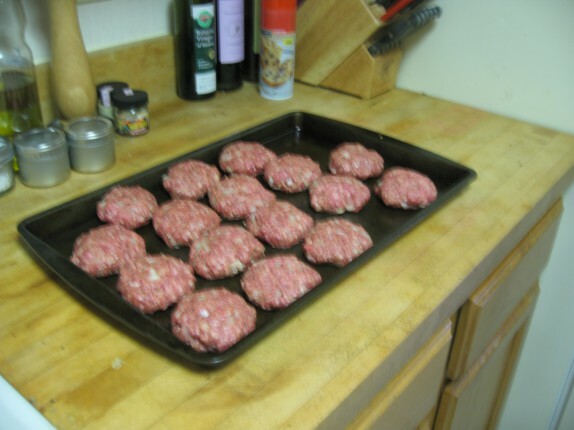 And I assembled the little burgers. First the burger on the bottom bun, then a small segment of bacon, then a chunk of Mahon cheese, which is something between swiss and cheddar, and then a small amount of BBQ sauce. And we enjoyed these crazy little things! The firm bread held these together nicely. 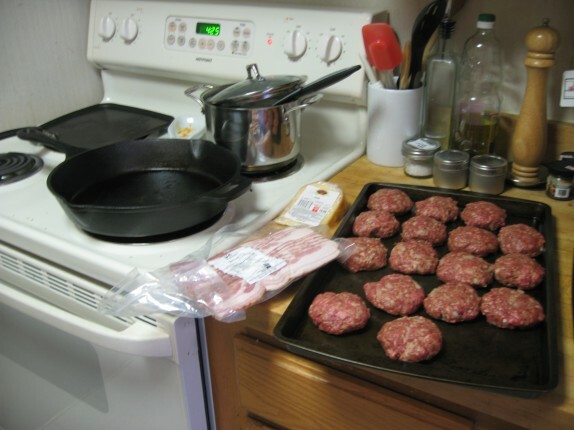 Because the burgers have so much moisture in the mix, much of it escapes during cooking, leaving the burger to begin to fall apart. But because I used cuts of meat with some good fat to get the flavors distributed, they came out amazing. The cheese added some creaminess and a bit of tang. Bacon is always great on a burger. The BBQ sauce brought some sweetness to every bite. 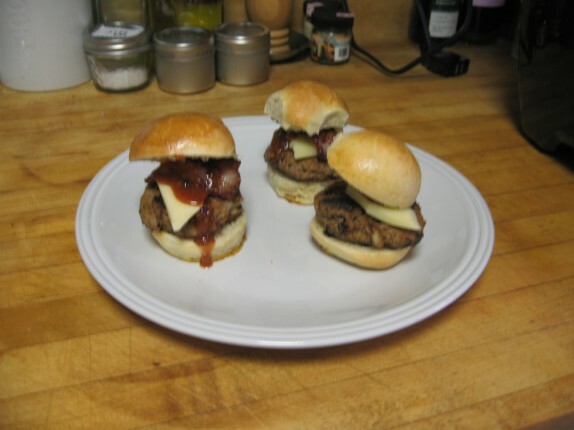 This is a pretty awesome way to make up burgers, and, even if I don’t do sliders next time, I may still use this method. These look amazing. Where can I get sliders for breakfast? Those look delightful! I’ll guess vinegar as the common denominator (ketchup, dijon, worcestershire), even though I’m likely incorrect…they all also contain lecithin (from eggs) as emulsifiers, but I’m stumped at how onions and s&p tie in…maybe I’m reading too much into it! As a side note, I’m curious if cooking on an electric stove bothers you? We’ve all had electric stoves at some point in our lives, but once you cook on gas (fire!) it’s really tough to go back. Cheers. I meant common denominator mathematically, like to try and scale the recipe back. I’ve gotten used to cooking on the electric. It’s not perfect, but, with good, heavy pans, and some finesse on and off the heat, I’m pretty good. Of course, there’s nothing like cooking with gas/fire. Sounds yummy!! I hope you will vote for me tonight! !